The tiger (Panthera tigris) is the largest cat species, reaching a total body length of up to 3.38 m (11.1 ft) over curves and weighing up to 388.7 kg (857 lb) in the wild. Its most recognisable feature is a pattern of dark vertical stripes on reddish-orange fur with a lighter underside. The species is classified in the genus Panthera with the lion, leopard and jaguar. Tigers are apex predators, primarily preying on ungulates such as deer and bovids. They are territorial and generally solitary but social animals, often requiring large contiguous areas of habitat that support their prey requirements. This, coupled with the fact that they are indigenous to some of the more densely populated places on Earth, has caused significant conflicts with humans. Tigers once ranged widely across Asia, from Turkey in the west to the eastern coast of Russia. Over the past 100 years, they have lost 93% of their historic range, and have been extirpated from southwest and central Asia, from the islands of Java and Bali, and from large areas of Southeast andEastern Asia. Today, they range from the Siberian taiga to open grasslands and tropical mangrove swamps. The remaining six tiger subspecies have been classified as endangered by IUCN. The global population in the wild is estimated to number between 3,062 and 3,948 individuals, down from around 100,000 at the start of the 20th century, with most remaining populations occurring in small pockets isolated from each other. Major reasons for population decline include habitat destruction, habitat fragmentation and poaching. The extent of area occupied by tigers is estimated at less than 1,184,911 km2 (457,497 sq mi), a 41% decline from the area estimated in the mid-1990s. Tigers are among the most recognisable and popular of the world’s charismatic megafauna. They have featured prominently in ancient mythology andfolklore, and continue to be depicted in modern films and literature. They appear on many flags, coats of arms, and as mascots for sporting teams. 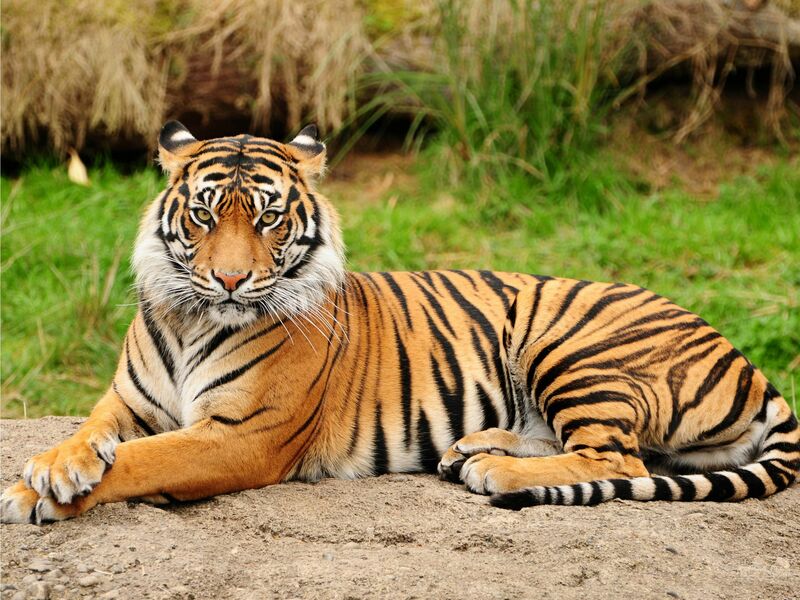 The tiger is the national animal of Bangladesh, India, Vietnam, Malaysia and South Korea.